Add butter and turn on machine, processing about 10 seconds or until the butter and flour are blended and the mixture resembles bread crumbs. Place mixture into a bowl and sprinkle with 3 tbsp of ice water. Use a wooden spoon to gradually gather the mixture into a ball; if the mixture seems too dry, add another ½ tbsp ice water and mix until you can gather into a ball with your hands. Wrap ball of dough in plastic wrap, flatten into a disk and place in freezer for 10 minutes (or 30 minutes in fridge) to ease rolling. At this point you could also refrigerate the dough for a day or two, or freeze it almost indefinitely. Mix sugar, cinnamon flour and salt in large bowl. Stir in apples. Unwrap dough, lightly sprinkle its top with flour and roll out onto a lightly floured board or countertop; if the dough is too hard, let it sit for a minute or two (it should give a little when you press your fingers into it). Take muffin moulds and line in the moulds with rolled pastry dough , prick with fork. 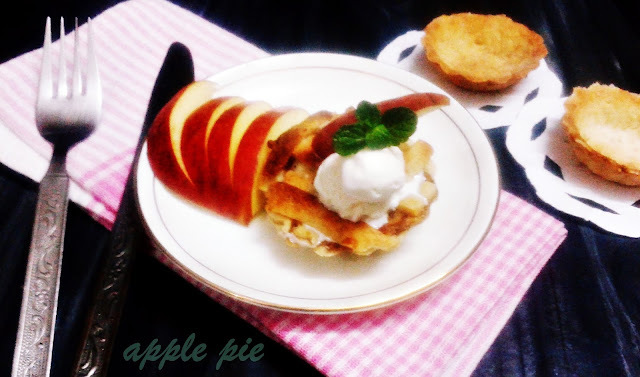 Fill in the apple filling. Roll some more pastry dough and cut strips out of it, cover the filling with strips,trim overhanging edges. Repeat the process and make more pies. Bake for 10 minutes or until crust is brown and juice begins to bubble through slits in crust. Serve warm with a scoop of vanila ice-cream. Mix all the ingredients in a bowl except oil and knead a soft dough using water as required. Keep the dough for rest under a damp cloth for 10 minutes. Divide the dough into small portions and roll into balls. Heat a tawa/griddle. Roll a dough ball in flour and roll it into a roti. Spread a little ghee on it and sprinkle some flour. Then gather all the edges in center and press lightly. 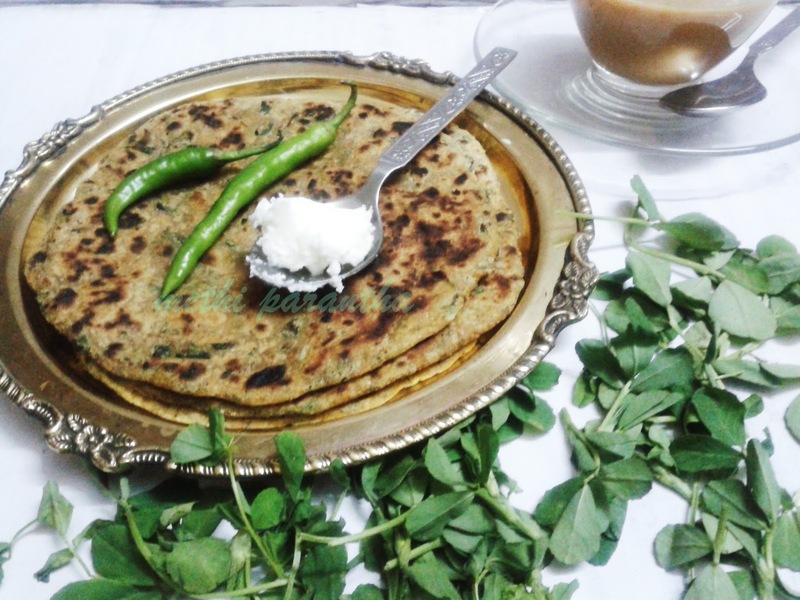 Roll it out into a small thick parantha using flour as required. Place the parantha on the hot tawa and cook. Turn it over and apply some ghee or oil. Turn over once again and apply some more ghee and cook till both sides are golden. Serve hot. Boil water with a pinch of turmeric powder in a large deep pan. When water starts boiling add whole cauliflower in it. Boil it for five minutes. Drain and refresh under running water. 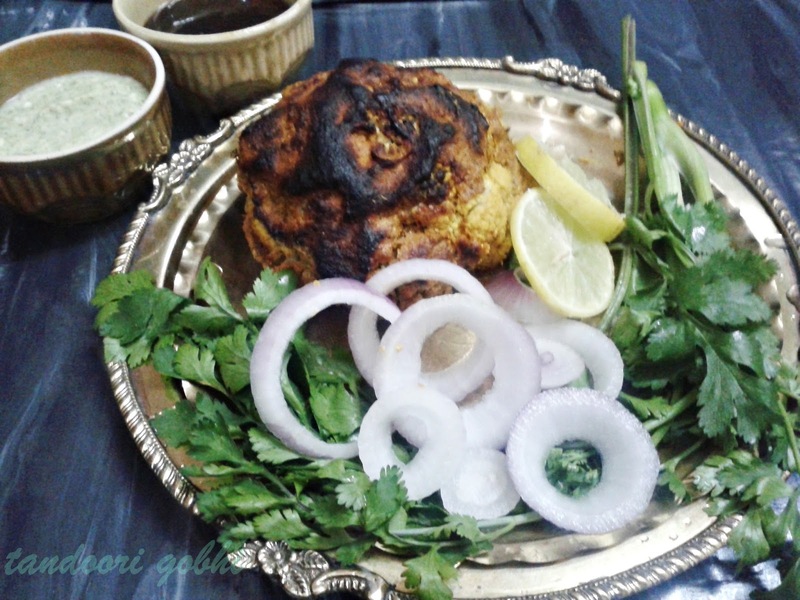 Heat a non-stick pan and dry roast besan on low heat till it gives out a nice aroma. Transfer it into a bowl and keep aside. 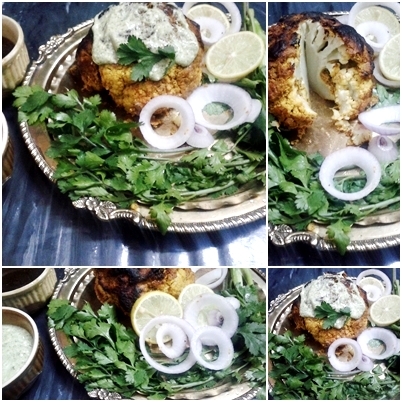 In a large bowl combine hung yogurt, roasted besan, kasoori methi, red chilli powder, turmeric powder, sabzi masala powder,jeera powder,green cardamom powder, lemon juice,garlic paste,ginger paste, schezwan chuttney, mustard oil,sugar and salt. Mix well and keep aside. Marinate the cauliflower in the yogurt mixture for an hour, fill the gaps as much as possible. Pre-heat the oven to 180°C. Cook the cauliflower in the preheated oven at 180°C till done. Remove when done, sprinkle olive oil and chaat masala and serve hot garnished with lemon wedges along with coriander chuttney mixed in some hung yogurt . Take fresh, tender and good quality Peas for preservation.Peal them and wash them thoroughly. Take water in a big vessel add salt and sugar and let it come to a boil. 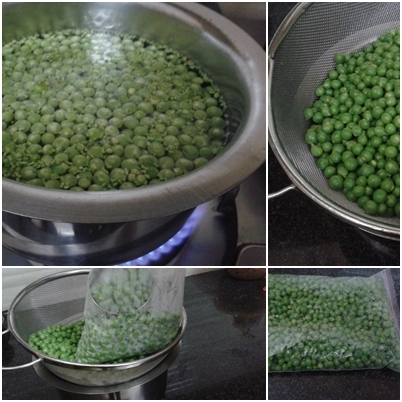 Put the green peas into boiling water for two minutes. After this turn off the flame and strain the peas through a sieve to remove excess water. 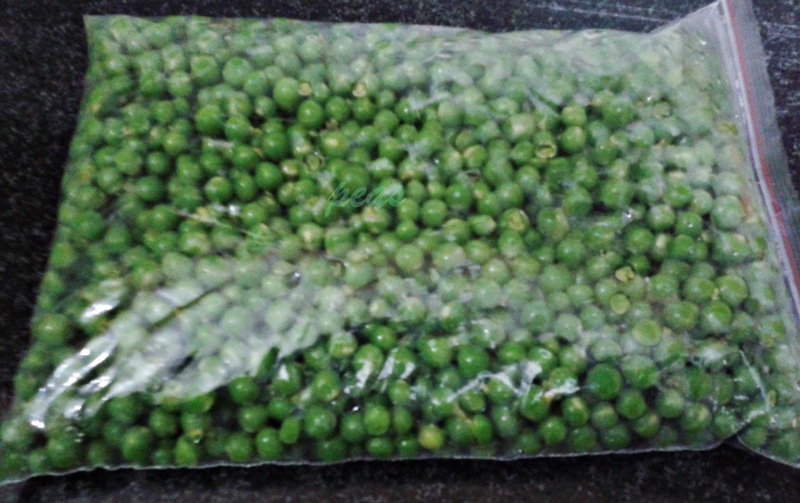 Fill these green peas in small polythene bags with the help of a ladle while they are hot. Zip lock it once and then open and let all the hot air go out and then quickly seal it again (this way vacuum will be created inside the bag and the bag will fill less space in side the freezer and chances of tearing of bag also reduce). Place them in deep freezer.